Listen to opening and closing credit themes below. This page is a reference to the different title and credit sequences over the series 17-year run. Since I get many questions about the themes, I thought it might be useful. If anyone has any further information about these sequences, I'd love to hear from you. Note: "Titles" refer to the opening of the show, with the name of the series; "credits" refer to the sequence at the end of the program, containing director/writer/cast, etc. information.  "and, of course, Lassie" (shot of Jeff and Lassie again). 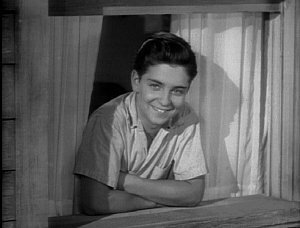 The credit shot of Jeff and Lassie was later reshot as Tommy Rettig got older, showing him in his second and third season haircut with his hair parted on the left. The theme song accompanying this sequence is, according to classicthemes.com, called "Secret of the Silent Hills," and was originally used in the 1940 film The Courageous Dr. Christian. It was written by William Lava. This opening was used for the first three years of the series. The syndication package that uses the "Jeff's Collie" titling usually uses the scene with Jeff in the bowl haircut. 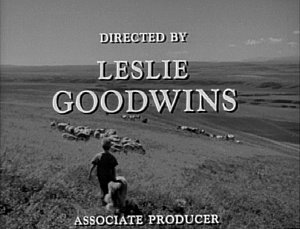 The credits for the first three years show Jeff and Lassie descending into an open field scattered with a herd of sheep. The theme played in the credits for the first two seasons is a reprise of the "Secret of the Silent Hills" theme. For the third season, a variation of that theme, reworked by composer Raoul Kraushaar and opened with a drumroll, was used over the closing credits. 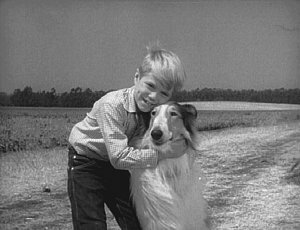  "and, of course, Lassie" (shot of Timmy and Lassie again). 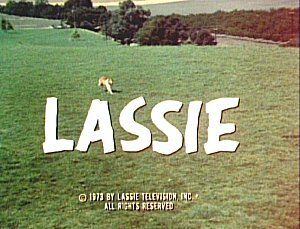 The credits, while still playing the revised Kraushaar theme, now show Lassie only (a forward shot, as in her leaping over the fence) in a clearing of a stand of trees. As the music plays, Lassie lifts up her right paw and holds it until the end of the credits. This black and white closing visual was used the longest, from episode 14 of fourth season through and inclusive of eleventh season, through four different theme song variations. 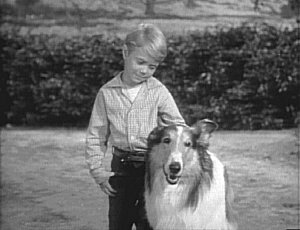 From the fifth through the tenth season, the music that most people associate with the Lassie series was commissioned. The composer was Les Baxter. It is usually referred to as "the whistle theme" (the whistle opening being done, again per classicthemes.com, by Muzzy Marcellino). It both opened and closed the shows, with some shortening in the ninth and tenth seasons, for that period of time. 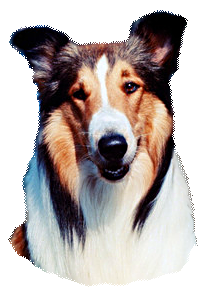 This theme is so closely associated with Lassie that it has been used in at least two television commercials featuring Lassie, 1-800-COLLECT and GE Securities Technology, and was also heard in both the 1994 feature Lassie and at the beginning of both new themes for The New Lassie and Animal Planet's Lassie. The narration for the opening did not vary from fifth through eighth season. 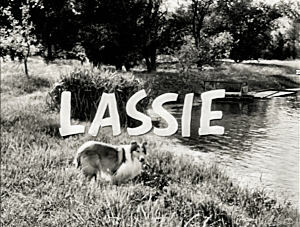 Lassie is again shown drinking from a lake, but in this refilmed sequence, the lake seems further away, surrounded closely by trees; it is more like a forest glade. 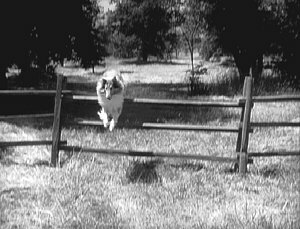 She responds to Timmy's callagain, with the title "LASSIE" 2 superimposed over the sceneof her name by crossing a pasture and leaping a three-barred fence (rather than the original four-barred one) and then trotting into the farmyard. 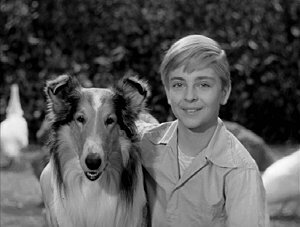 The reworked narration is now "Starring June Lockhart, Hugh Reilly, George Chandler [when he was in the opening credits in fifth season], Jon Provost as Timmy [the "as Timmy" is removed in eighth season], and, of course, Lassie." However, the visuals that go with this narration differed as the seasons progressed. 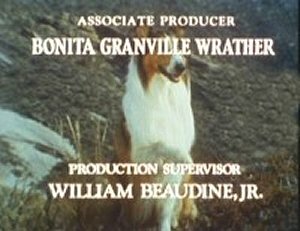 The original title sequence, detail shown above, which was also kept for the early syndication runs (1960s-1970s), had Timmy standing in the farmyard petting Lassie, Ruth in front of the screen door of the farmhouse, and Paul at the door to the barn (Uncle Petrie, when included in the title sequence, is still standing smoking his pipe). 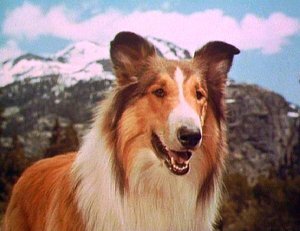 The Lassie used in the sequence was "Lassie Jr," the son of the original Lassie, who performed from season 1 to 5. 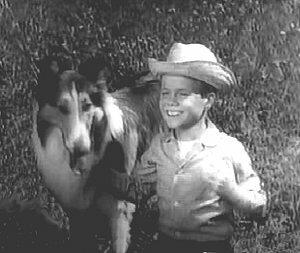 For Season 6, a son of "Lassie Jr" was used for several seasons. This dog, nicknamed "Spook," very identifiable due to his wide blaze, was used in the second Timmy title sequence. This time, after Lassie jumps the fence, Timmy and Lassie are shown walking down a country lane, Ruth is again in the kitchen doorway, but in a different position, and Paul in the fields leaning against a piece of irrigation equipment. At the end of this sequence, Timmy kneels down and hugs Lassie when the narrator mentions her name. 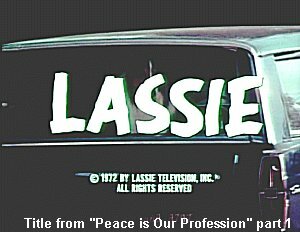 This is the title sequence that has been used on the syndicated package of Timmy and Lassie episodes since the 1980s. The third title sequence exists for seventh [possibly] and eighth season, although it does not turn up in the syndication package. This shows Timmy with "Baby," who took took on the Lassie name from "Spook" and who was also a son of "Lassie Jr." They are picking fruit in the orchard and Timmy is wearing his straw hat. Ruth is shown in the kitchen, ironing with the sideboard behind her, rather than in the doorway, and Paul is moving a bale of hay. Thanks to a YouTube posting and a note from a gentleman named Bob Brinkman, I have identified a fourth opening used for the ninth and tenth seasons. 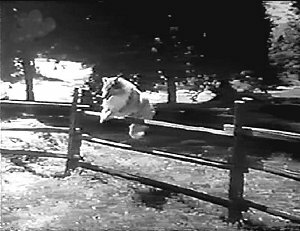 After Lassie leaps the fence, with the names of the cast posted onscreen instead of spoken, the scene immediately fades to a clip of her walking slightly uphill and observing the countryside, which was taken from "Lassie's Odyssey." The music accompanying the titles are the beginning of the whistle theme for ninth season. For tenth season only, the revised whistle theme is used with these same visuals. There is yet a fifth, very rare opening Timmy and Lassie sequence. 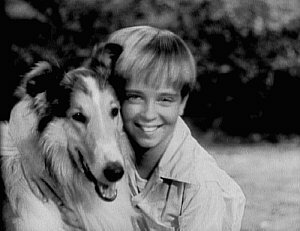 The Timmy episodes were briefly rerun on CBS Saturday morning children's block under the title The Adventures of Lassie. 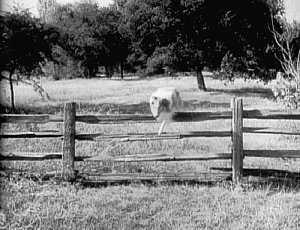 A truncated version of the whistle theme is played, Lassie runs from the lake with "The Adventures of LASSIE" superimposed at the beginning, but her approach to running and jumping the fence is shot from an angle instead of from straight in front, so we see the scene as if we are standing at Lassie's left when she goes over the fence. 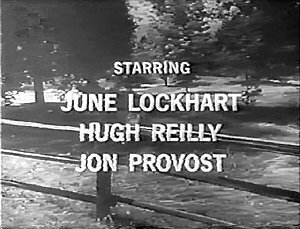 The words "starring Jon Provost, June Lockhart, Hugh Reilly" are superimposed on the screen before she does so in plain block letters. 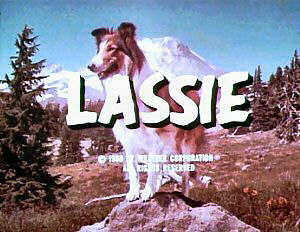 Only when a closeup of Lassie ends the sequence does the announcer say "The Adventures of Lassie." While the "whistle theme" remained the theme of the tenth season credits, it was revised for that year. During tenth season, Nathan Scott took over the score duties from Baxter and music director Sid Sidney. All the incidental music in the episodes completely changed as well. The whistle itself was shriller, and the concluding instrumental portion was completely reworked. Eleventh season brought a new shakeup to the music. 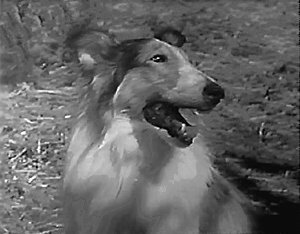 The "Lassie Theme" was still being used, but the portion that used to be whistled was now instrumental as well. This instrumental whistle theme lasted, with some variations in tempo and concluding notes, through and inclusive of season sixteen.  The opening sequence was also changed for the first season of Corey Stuart episodes, and from then on, only Lassie was shown in the opening credits; the human cast was not acknowledged. 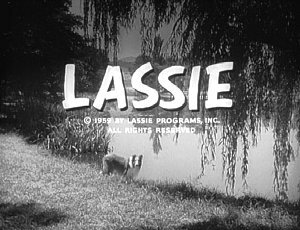 The eleventh season opening sequence showed a lake in the background, with Lassie trotting up in the foreground from the viewer's right to stop while the title "LASSIE" was superimposed on the screen. 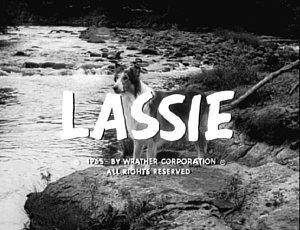 This was the final season for the long-running black-and-white credit sequence with Lassie facing the viewer and holding up her right paw. Starting in twelfth season, the series was shot in color. 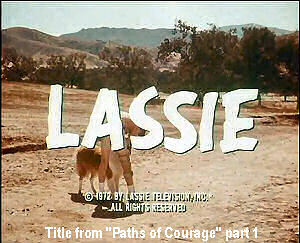 The new opening titles and closing credits took advantage of this to show off Lassie and the surrounding countryside. 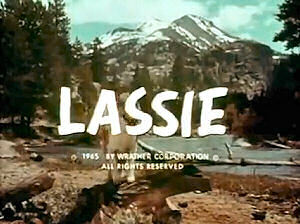 The original color titles show Lassie in front of a river banked either side by trees, which segues to a segment of Lassie trotting into a clearing with a mountain peak in the distance, over which the title "LASSIE" comes up and which then fades to a close up. The later opening titles showed a blue sky with dark green trees and a snowcapped mountain on the horizon. In the foreground was an outcropping of rock against green grass; Lassie mounted the rock to look around, her fur ruffled by the breeze, and the sequence then faded to Lassie trotting into the same clearing with the mountain in the background. Several different versions of the theme song are used with these sequences, one a straight musical version, another with a piano arpeggio proceeding the theme. 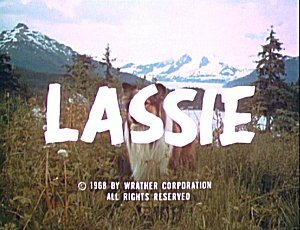 For syndication, the later title sequence was truncated just to show Lassie running up to the rock and mounting it to look around, taken from a slightly longer sequence from the 1968 titles. 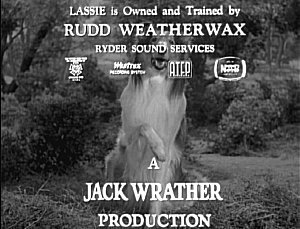 For the closing credits, two sequences, similar, were shot: Lassie, in half profile instead of from the front as in the previous seasons, holding up her right paw. The original closing shot was akin to a closeup of Lassie; she fills almost all the scene and faces to her left. The later ranger episodes used Lassie again with a lake in the background, with mountains in the distance. 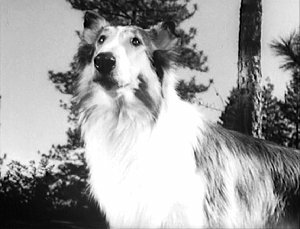 She is shown in closeup before the LASSIE title zooms in from the center of the screen to the foreground. Briefly following this sequence is a close up from another angle. 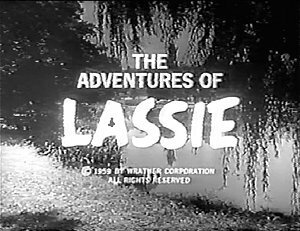 Two different arrangements of the Lassie theme are used with these titles. The second version of the color closing shot, starting in Season 14, is zoomed out a little. Lassie is standing on a rock in the midst of pine trees with blue sky in the distance. She is facing to her right in this scene. 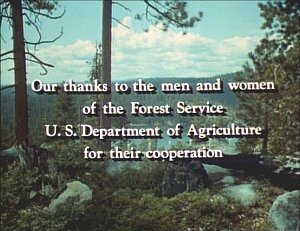 A closing screen saying the program was produced in cooperation with the United States Forest Service and emblazoned with the Department of the Interior seal, followed the credits during the forest service-based episodes. This closing sequence remained through season seventeen, but in season seventeen the United States Forest Service graphic was omitted. The seventeenth season (last year on the CBS network) and eighteenth season (first Holden ranch season, in syndication) were unique in that no stock title sequence was used. You may see a stock title on seventeenth and eighteenth season episodes, but they were not there originally; these were added when the series went into syndication. Instead of having a standard title sequence, the story would just begin. A minute or two into the story, the action would pause, the background musicusually a brisk, upbeat version of the "Greensleeves" themewould build to some type of crescendo, and the title LASSIE would come up and over the screen. The show would then cut to the first commercial break. 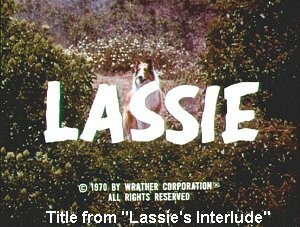 At left is the unique title sequence from "Lassie's Interlude." There are three more unique title sequences on the seventeenth season page. Shown are two title sequences from eighteenth season. There are more on the eighteenth season page accompanying the appropriate episode. After the sixteenth season, the "Lassie Theme" (with or without the "whistle") was finally abandoned. In its place in the credits was an instrumental version of the medieval "Greensleeves" theme (also used as the music for the Christmas hymn "What Child is This") with a very strong metronomic beat to it. The photo end credits had also come to an end in the seventeenth season. The background was now plain green in seasons eighteen and nineteen. For the final season of the series, also shown in first-run syndication, a new static title sequence was used with yet another version of the "Greensleeves" theme. 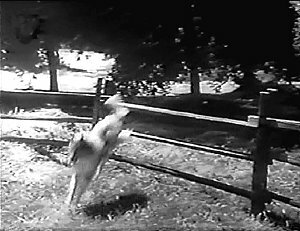 This arrangement was slow, dreamy and lyrical, and showed Lassie returning to her roots in leaping a fence (with two bars this time); then she lopes over lush green fields, with the "LASSIE" title coming up at the very end. This is, sadly, the best information I can assemble about the opening and closing theme music. 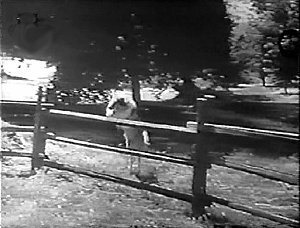 The episodes have been so butchered by syndication changes made to make the episodes more uniform that is hard to tell, especially after the farm episodes, when the show had at least five different credit sequences which were made uniform after 1974 and featured the same syndication image of Lassie against Mount Hood, even the seventeenth and eighteenth season shows, which originally had no standardized credit sequence. These music sequences have been assembled from the American and British DVD releases, and in a few cases from original prints sent to me by Very Helpful People (thank you!) or posted on YouTube. 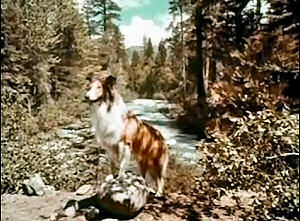 Lassie Original Titles With Jeff Per a 16mm print, this is the original Lassie opening sequence, and comes from the second season episode "The School"
Lassie Original Titles With Jeff (alternate version) This is an alternate version of the original opening with a different narrator, who has more of a "country" accent. From 1955. Lassie: Season 15 Titles (Scott/Bob episodes) With flute/(clarinet?) and harp predominating. Lassie: Season 16 Titles (Scott/Bob episodes) Same arrangement as Season 15, but more orchestral. 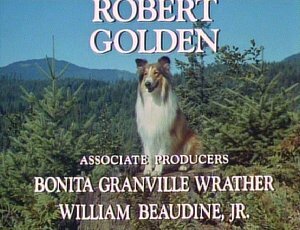 Lassie Later Ranger Credits This version has more brass to it; began during Season 14. If you have any of the German or French season sets, or the nine DVD Lassie compilation film sets in Region 2 format, you will have noticed another theme song, one that can be found on YouTube by searching for "Lassie theme played on piano." I asked someone associated with the Wrather family about this piece of music and was told that it was not an official Lassie theme. I suspect that when the series was shown in Europe, the copyright to the theme music did not allow it to be played there, so that a European-written theme was used instead, and this is the "other Lassie theme" that many people refer to. This is not uncommon with series distributed outside the United States: British reruns of The Adventures of Rin Tin Tin use a completely different musical soundtrack, and Fury, shown in Germany and released on DVD there, uses the series' background music, but not the title music. 1 In reruns this title was "Jeff's Collie." 2 In reruns this title was often "Timmy and Lassie."